RI-Wine of Ascot will hold wine testing on Bartonwyatt.tv launch which will take place at Foxhill Golf and Country Club, Ottershaw, Surrey. The information about RI-Wine of Ascot business and services will be published in December 2009 issue of Barton Wyatt Surrey Magazine. Taken over a year ago by a significant private individual from America. The owner is reputed to have the finest collection of wines in America. He has set up a private dining restaurant in New York with 4000 of his favourite wines from his own collection on the list and food to match. Krug restaurant aims to be a pinnacle of vinous delight. He has bought the estate after years of research and is just beginning to make his own wines. This Rosso is his first, and already shows the direction of quality he is going in. An estate to watch. A smooth wine, but with significant structure and tannins, and persistent hints of fresh but well-ripened fruit. 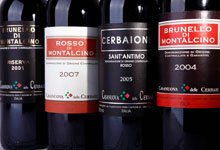 It comes from the firms same vineyards used to produce the Brunello. Large Sangiovese grapes called a Brunello in Montalcino with the denomination cascade. Manual choice of grapes in perforated cases delicately unloaded directly into the hopper of the stemmer. In new Slavonic oak barrels, refined in bottle for a minimum of four moths in an air-conditioned room. Degree of alcohol 13,5 % vol. Red, intense ruby colour With violet nuances, limpid. Full persistent fragrances, fruity hints well blended with woody scents. Significant structure and tannins, smooth with persistent hints of fresh but well-ripened fruit.